St. Charles City Hall is located at 200 North Second Street, St. Charles, MO 63301; phone: 636-949-3200. Photo: Section of Stone Row, ca. 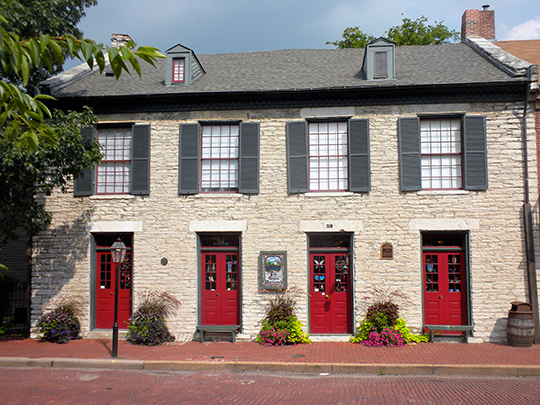 1815, 318 South Main Street, St. Charles, MO. Listed on the National Register of Historic Places in 1969. Photographed by User:Smallbones (own work), 2010, [cc-by-1.0 (creativecommons.org/publicdomain/zero/1.0/deed.en)], via Wikimedia Commons, accessed January, 2013. St. Charles, spread upon the bluffs that overlook the Missouri River approximately 20 miles northwest of St. Louis, is a city of precipitous streets, attractive terraces, and shaded lawns. First permanent settlement on the Missouri, and first State capital, it has a leisurely charm, rich in historic associations and natural beauty. Each of the peoples who have lived here has imprinted something of its culture on this farming and educational center. During the early days, St. Charles was the funnel-mouth through which French trappers, Spanish explorers, American pioneers, and German immigrants flowed towards the western fur trade, the rich soil of the plains, and California gold. The old ferryboat landing at the mouth of Blanchette Creek in the southern portion of the town is overgrown with weeds and trees, and its existence almost forgotten; but the Boon's Lick Trail, which led west from here, following for a time the vagaries of the little stream, is still used. Progress has scarcely touched the tiny valley, so that the starting point of America's greatest highway has changed little from the time when high-wheeled covered wagons, strings of pack mules and horses, and trudging, impoverished settlers turned hopefully Westward along its route. The business district, dominated by the copper dome of the gray stone courthouse, climbs abruptly from the river front. Higher up the bluffs, between the business section and Lindenwood College, stretch the residential streets. Here level space is prized, and the houses crowd close together. A few are modern dwellings, but many are old, with second-story balconies and green shutters. Along Second, Third, and Fourth Streets are the neat, square, jig-saw-trimmed houses of the descendants of German settlers, and several large Gothic-Revival churches. At the extreme western edge of town is the campus of Lindenwood College for women. Although a portion of St. Charles' population finds work in the American Car and Foundry Company plant, in the brewery, shoe factory, and lumber yards, the city's economy is based chiefly upon the rich farms that surround it. The people have become almost completely Americanized, but here and there some folk tale or legend, some piece of furniture or bric-a-brac, reveals a French or German heritage. Legend and tradition confuse the story of St. Charles' beginnings. It is thought that the first settler, Louis Blanchette dit le Chasseur (nicknamed the hunter), a French-Canadian, came here with his Pawnee Indian wife, Angelique, in 1769, and built a cabin near the mouth of the creek now named for him. The low bluffs which form the background of the town were the first high ground west of Missouri's junction with the Mississippi. Safe above flood waters, yet accessible to the nearby fertile bottom lands, the site also afforded conspicuous trade advantages. Other French-Canadians arrived, and gradually scattered cabins grew into a village, which took its name from the bluffs the Creoles had called Les Petites Cotes (the little hills). In 1781, there were but half a dozen houses, and this number was no more than doubled during the succeeding ten years. The first inhabitants preferred a mode of life only slightly less roving than that of the Indians. A few engaged in farming, but the majority seem to have supported themselves by hunting, fishing, and trapping. Between 1780 and 1786, the Spanish government tried to discourage settlement west of the St. Louis district by refusing to issue or approve land grants, but the pressure of settlement westward was irresistible. In 1787, August Chouteau surveyed the settlement, and St. Charles as a town may be said to date from that year. Soon afterward, the District of St. Charles was formed, comprising an area extending west from the Missouri River boundary of the St. Louis District, theoretically to the Pacific Ocean. Blanchette was made commandant, and his cabin on block No. 20, bounded by McDonald, Main, Missouri, and Water Streets, became the seat of this empire. Slowly, life in the village began to change. On November 7, 1791, the church erected by the Roman Catholics of the community was blessed under the Invocation of San Carlos Borromeo, sixteenth century Archbishop of Milan. Subsequently, the settlement was known by the Spanish name, San Carlos del Misuri, Anglicized after 1803 to St. Charles. In 1793, Blanchette and Angelique died, and Charles Tayon was appointed civil commandant (1793-1801). Immediately, Tayon announced that Blanchette and the original settlers had no legal title to the land, since their claims had not been approved by the governor general at New Orleans. He then granted to himself the property on which the government buildings were located, and divided Blanchette's other real estate and possessions among his own followers. The block on which the first church stood was granted to Joseph Piche and Louis Chancellier; even the old stone fort that stood on the hill 250 feet above the river was abandoned to private interests and converted into a mill. On January 11, 1797, the people petitioned for, and 12 days later received, a grant of land to be used as a common field — a large tract divided proportionally among the inhabitants. The lots in the commons were similar in extent to lots in St. Louis; 1 arpent in front and 40 in depth. Under Spanish encouragement, many American settlers came to the territory. Among them were the Boones — Daniel and his wife, Rebecca, and their sons, Nathan and Daniel Morgan, and various relatives who arrived in St. Charles during the late 1790s. The Indian trade by which Blanchette and his fellow French-Canadians had prospered gave way to a more highly organized commerce.